Fairfield Giants' running back Tommy OíConnell blasts through the Bridgeport defense helped by center Owen Miller (88) in action last weekend. The Fairfield Giants' Mitey Mites Juniors lost to the Milford Eagles Oct. 6 at Sullivan field and lsot 13-7. The Giants scored on their first possession of the second half on a 30-yard run by Sean O'Neil that set up a Rogan Kane touchdown and a Tyler Bartlett extra point that tied the score at 7-7. Fullback Charley Moore carried the ball for additional key yardage, but Milford got the game-winning touchdown late in the fourth quarter. Defensive efforts once again led by Joe Macri, Mathew Mitchell and Parker Pasmeg. The Giants are 2-3-1 as they host the Stratford Redskins this weekend. The Fairfield Giants Mitey Mite seniors lost to the Milford Eagles 34-0 last weekend. The Giants' defense was led by Jack Melbourne, Anwar Sally, Thomas Kramer, Sean Donohue, Jamie Capposella and Mathew Selca. Turnovers and injuries hindered the offense from mounting any sustainable drives. The Giants mustered a total of four first downs for the game. 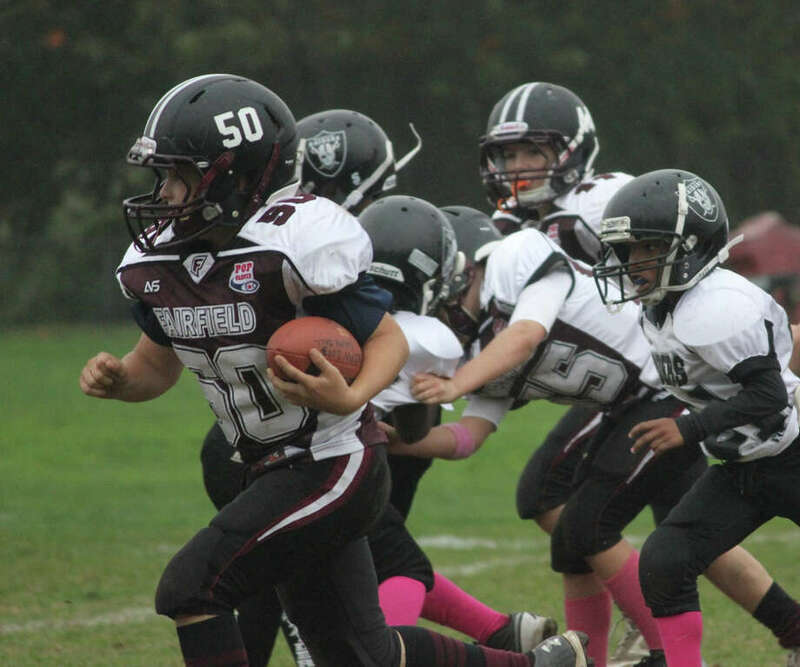 The Giants Junior Pee Wees posted their third shutout in six games, not allowing a first down all game against the Bridgeport Raiders in a 32-0 victory. The Raiders had won three in a row. On the first play from scrimmage, Giants defensive end Brendan Dunleavy, outside linebacker Finn Donelan, and tackle Charlie Wilcox jarred the ball loose, and it was recovered by Donelan. Fairfield QB Nick Morris scrambled 46 yards for an opening-play touchdown. The Giants went on to score three more times in the first half, and then again in the second half. Michael Innaimo added scores from 5 and 15 yards out. Tommy O'Connell and Dunleavy each scored on runs and also racked up two conversion attempts each. Peter Strang, Gavin Toth, Griffin Harding and Grady Bartlett shut down Bridgeport. Game standouts included Alex Lynch, Hank Hackett, Luke Martucci, Dylan Fragomeni and Aaron Sepot. The Giants take on West Haven this weekend in a divisional matchup. The Giants' Pee Wee team rolled to its fifth victory of the season by winning in Milford 35-6 last weekend. Five players scored for the Giants. Finn Duran got things going on the Giants' first possession by and racing down the sidelines for a touchdown, with the conversion by Kristo Boci, who was 2-for-2 on PAT kicks. Aidan Wykoff blasted his way for the next score. Sam Roberto ran in for the next TD, set up by recovering an onsides kicks. Pacing the Giants' offense in the second half were quarterback Hayden Beiser, wide receiver Brian Kiremidjian, andrunning backs Owen Sherman and Peter Schwartz. Seamus Malloy (running PAT) and Kiremidjian had interceptions. Jake Simonelli and Brandon Moutinho contributed with rushing yardage. Amity visits Sunday at Sullivan Field. The Junior Midget lost 6-0 at the Milford Eagles on Oct. 5. Milford scored in the first quarter. The Giants defense was led by Philip Pasmeg, Johnny Blatt and Eric Pierpont. The Junior Midget will host Amity on Sunday at 2 p.m.